It's nothing personal . . .
Everyone knows that irritating encounters with coworkers can trash your day -- and career. Now you can finally do something about it. Whether your company has 10 employees or 10,000, sooner or later you're bound to end up grappling with people in the office you can't stand. But that doesn't mean that you have to let them throw you under the bus. I Hate People! 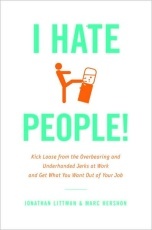 is a smart, counterintuitive twist on the classic workplace self-help book that will show you how to identify the corporate clods you hate the most -- while giving you the techniques you need to help neutralize them. Outfox the Ten Least Wanted -- the underminers, micromanagers, and backstabbers who prowl the corporate minefield. Become a Soloist -- one of those bold individuals who dare to work alone or with a few handpicked talented people -- while artfully deflecting the rest. Dig Your Cave and Island Hop -- sanity-saving techniques that will help you effectively carve out space and time for yourself. Rejecting the failed culture of phony niceness that has harmed so many companies and individuals, I Hate People! offers a handy, amusing compass to help you navigate today's perilous workplace . . . while leaving the idiots behind.